Cactus Language partners with Tropical Sushi! We are very excited to announce that Tropical Sushi is partnering with Cactus Language, bringing exclusive discounts to all of our evening language class students. 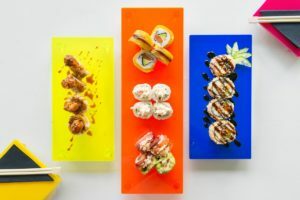 Tropical Sushi is a new sushi concept, based in Brighton, where you can enjoy fresh and flavourful fusion sushi, served with the warmest Latin hospitality. The menus are specially designed with a variety of combinations that satisfy vegetarians, vegans and people with allergies and intolerances. They make it as they like to eat it; experimenting with different flavours from both Asia and Latin America, creating unique and delicious combinations that will leave you wanting more! As well as amazing sushi, Tropical Sushi offers workshopsto learn how to make delicious food with traditional Japanese techniques. You can choose between 3 different levels, depending on your previous knowledge and expertise. How can I get the discount? You will get a massive 20% off food from Monday to Wednesday (lunch and dinner service) and 10% off food from Thursday to Saturday, just by showing your course confirmation email. Cactus students will also receive a 15% discount for the workshops, making them just A?15 a go! Tropical Sushi is situated in Hove’s Western Road, a stones throw away from Brighton centre. Take a bus from the Cactus school in Brighton and you will be there in less than 15 minutes. Don’ miss the chance to taste the best Latin Japanese fusion and book your table at Tropical Sushi here!